Screw shoe trees with fold-down handles have become a big favourite with shoe lovers. 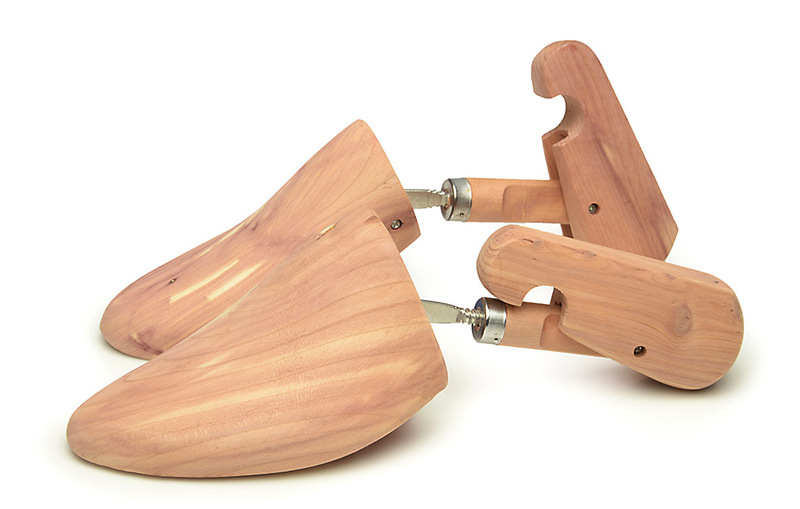 Easy to use, this shoe tree is crafted from aromatic cedar wood and will keep your footwear in a good shape. It will eliminate wrinkles from the leather upper, straighten the insole and absorb excess moisture. The split toe of our cedar wood shoe tree is connected with the wooden counter cap by a metal shaft, which is adjustable in length and slope. In turn, the back end of this metal shaft is enclosed in a wooden frame. With a rotation of the long axis you can regulate the space between toe and the counter cap. The fold-down handle meanwhile changes the length and pressure of our cedar wood shoe tree and fills the role of counter cap at the same time. 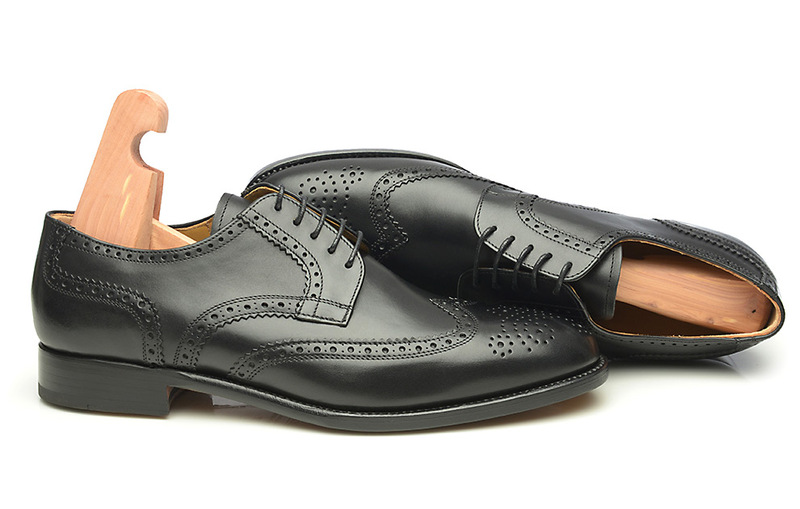 Adjusted the shoe tree once and it will exert the same pressure from heel to toe each time you use. Place the shoe tree inside your footwear right after taking it off. Warm leather is much easier to straighten and allows the long-lasting aromatic cedar odour to absorb any humidity, too. Please be careful with the adjustment though: too high pressure could damage the cedar wood shoe tree. 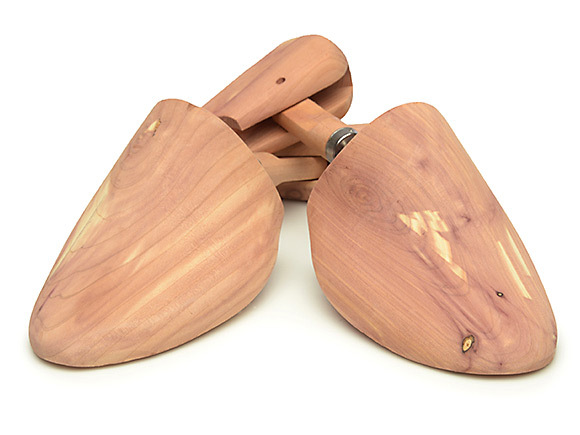 This cedar wood shoe tree is crafted from natural and eco-friendly wood. The extremely soft and aromatic cedar material is packed with benefits for your shoes. Its pleasant aroma helps absorb excess humidity, protect the Thujaplizin oils in the footwear and repel wood worm. 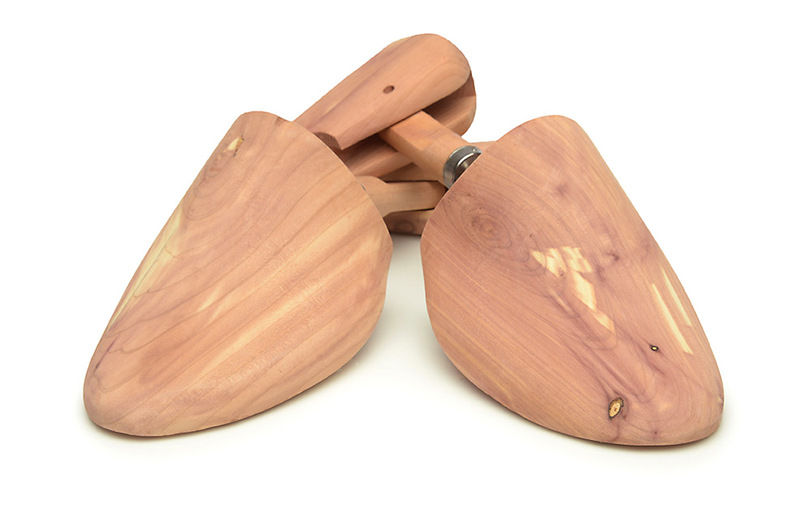 Our cedar wood shoe tree is available in double sizes 36-37, 38-39, 40-41, 42-43, 44-45, 46-48 and 49-50. Please note: If you bought a shoe model, which is crafted on the sharp pointed “extravagant shoe last”, please order a shoe tree in a smaller size. 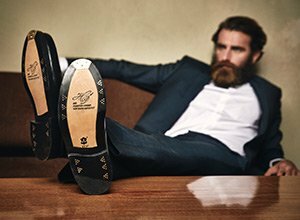 Men’s shoes with a small shoe last are 337, 340, 350, 351, 360 & 390.